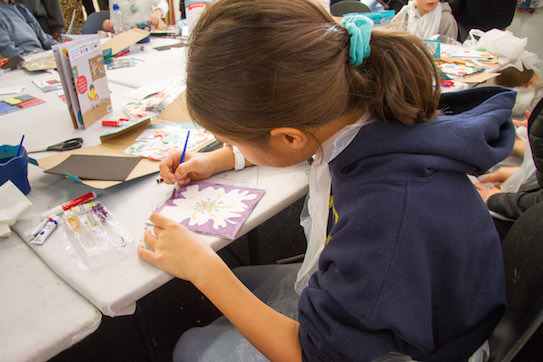 toucanBox was invited to host a creative craft workshop this past weekend at the Affordable Art Fair in Battersea. The Affordable Arts Fair is fast becoming global phenomenon. Started in Battersea in 1999, the team behind the fair now host bi-annual events at the exhibiter’s space in the beautiful Battersea Park, as well as annual shows in Hampstead, Bristol, Amsterdam, Brussels, Milan, Hamburg, New York, Toronto, Hong Kong and Singapore. Originally conceived as an alternative to the regular gallery shows, the Affordable Arts Fair aims to make art accessible for everyone, showcasing purchasable work (up to the value of £6,000) from an eclectic, ever rotating group of artists. And it turns out we share a very similar vision. The aim of toucanBox has always been to unleash creativity in everyone. 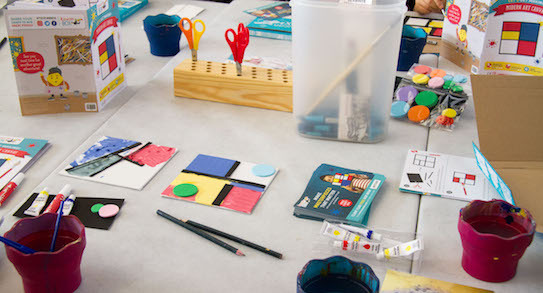 We believe children should have access to unlimited creative endeavours, bringing out the artist in each individual. So it seemed like a perfect match. 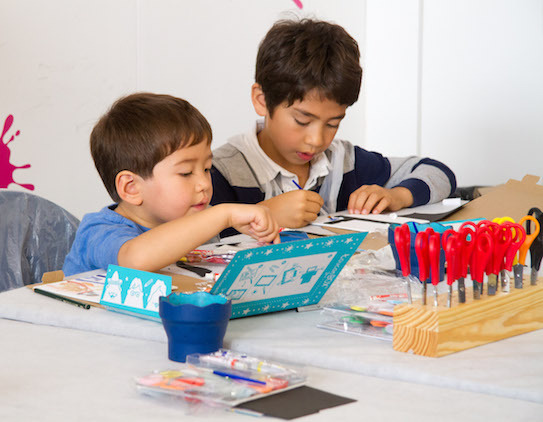 We were invited to host a free 3-hour workshop, encouraging the young visitors to sit down and make some masterpieces of their very own. 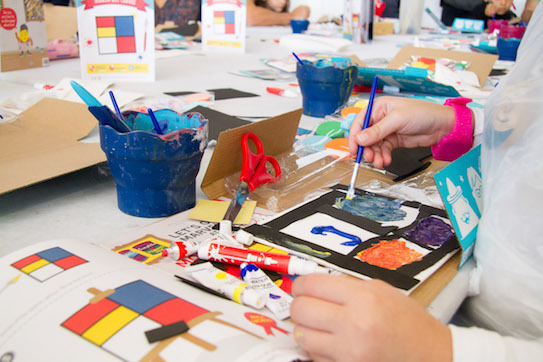 We took along with us the very apt Modern Art Petite toucanBox, using Piet Mondrian as an inspiration to create a colourful canvas, as well as imitating Walis Kandinsky’s circle paintings, and learning about other masters of modern art in the activity book. The box is available as part of the regular toucanBox subscription, but you can also pick it up as a special one-off from our online shop. We bunkered down in the ‘Creative Space’ from 12pm-3pm. Before we’d even officially kicked off the table was packed with parents and children. 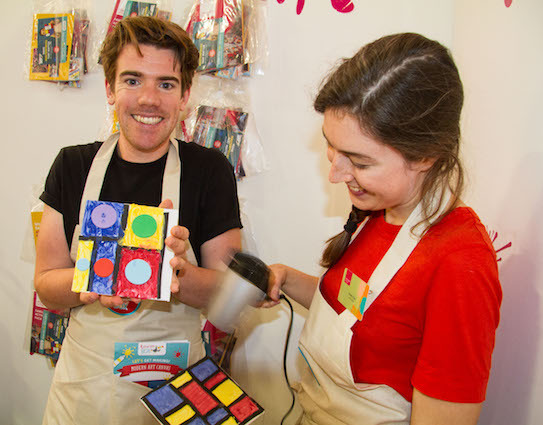 Together they accepted the toucanBox challenge - recreate your very own Mondrian. But we’re not always about following the rules: while each box contained everything they’d need to make the Mondrian canvas, that by no means meant they had to. Nope, if inspiration was striking our visitors then they could make anything they wanted. We saw some very creative designs, from classic painting to children experimenting with symmetry and lots of varied mixed media projects. The combination of watercolour paint and foam shapes resulted in some eye-popping 3D projects. All in all, 70 children got to show off their artistic skills, and take some beautiful work home with them at the end of the day. For us it was great to see that many toucanBoxes get created in one space at the same time. It reminded us that even with specific materials and set guides, every single toucanBox output is fantastically unique.